How authors read their work is a continued source of fascination for me. (And now that I've gotten several of my own events under my belt already this spring, I can discuss the topic without having to breathe from a paper bag.) 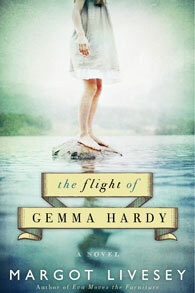 Wednesday night I went to hear Margot Livesey read from her new novel The Flight of Gemma Hardy. From Ms. Livesey’s flap copy: “A captivating tale, set in Scotland in the early 1960s, that is both an homage to and a modern variation on the enduring classic Jane Eyre.” Isn't that a terrific premise? I was intrigued, and so were forty or so other people on a Wednesday night in Vermont. Ms. Livesey enchanted her audience with her gorgeous Scottish accent. She opened her event by reading another writer’s humorous poem, entitled Scotland. This was a stroke of genius. The trouble with reading your own work is the potential for an hour of a “me me me” focus that’s tough to shake. Not only did the poem set the mood as well as provide a chuckle at the end, it helped to open up a broader cultural conversation. In those few pages, the narrator loses both parents at an early age and is made to leave her seaside home. By the time the brief reading was through, the audience was ready to buy the author sandwiches and sign her adoption papers. The book is not, of course, a memoir. But the combination of the first person POV and a skilled reader sure made it sound like one. And that was my epiphany--that reading a 1st person narrative compounds the personal nature of reading one’s work in public. Not only are you exposing your inventions and your view of the world, but you’re stepping into your main character’s shoes in public. No matter how hard you labored to make sure that the work wasn’t autobiographical, it’s going to sound like it is. And there's little you can do about it. Tardy note to self: reading from a third person narrative must be easier. Other notes: Ms. Livesey made a point of announcing, just before she read, that she didn’t read the text exactly as written, but rather a gently edited version which was better for “listening.” Huzzah! And wouldn't you know? She was asked handfuls of thoughtful questions. Wow, thanks for sharing this - good ideas - to read something not your own, and there is nothing wrong with gently editing. You're right, hearing a author reading their work is wonderful - my memoir is in first person - I'm going to have to get this book to see how it is handled by her. Thank you for this. I can just hear her, and I feel instructed by her (and by your description of her reading). My novel is in first person and it draws on my experiences; certainly if and when I get a chance to read to people from its pages, it will sound like it's about me. It's not, but I'm fairly warned. Very timely post for me! I will be presenting my book for THE FIRST TIME in April and these points are very useful for me. I don't think I'll pull it off with much panache, but if I can get to the end of half and hour without falling over in a twitching faint I'll be grateful. Please keep the tips coming. Margot Livesey is brillant! Gemma Hardy will worm her way in your heart and she will become forever a part of you. How can you not love a young girl who's only blood relative passes away and is mistreated and sent to live at a school as a "working girl". But as much as I would have given attitude and felt sorry for myself, Gemma rises above and ends up getting a job as an au pair. Gemma has such a way with her you can't put the book down for two seconds, you want her to find someone to love and someone that loves her. You want her to go to school and be successful. Gemma doesn't give up.